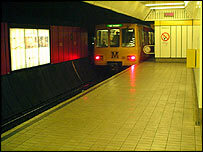 People travelling on the Tyne and Wear Metro can now talk on their mobile phones even when they are underground. Mobile phone operators O2 said it would be the first time complete coverage had been provided to a UK underground system. Passengers can make calls and send text messages on trains, even when they are deep below the centre of Newcastle. It is hoped the technology could be used in other underground systems - including London - if it is successful. The new antennas, which are below ground level, will also connect mobiles in nearby underground shopping centres. People with mobile phones from O2, Orange, T-Mobile and Vodafone will be able to use their phones on the Metro within the next few days. Tom Yeoman, from Metro operator Nexus, said mobile phone coverage was something passengers had asked for. He said: "It is the big four operators who got together in a consortium and approached us about three years ago with a view to doing this. "I think they are looking to expand it out to other underground train networks, possibly even the Tube in London." Derek McManus, head of Network Operations at O2, said the new system marked a landmark in mobile phone technology. He said "We know that the underground was one of the last places in the UK where you couldn't make and receive calls. "We do encourage all travellers who use their mobiles on the Newcastle Metro to respect the space and privacy of other travellers and display considerate mobile etiquette."